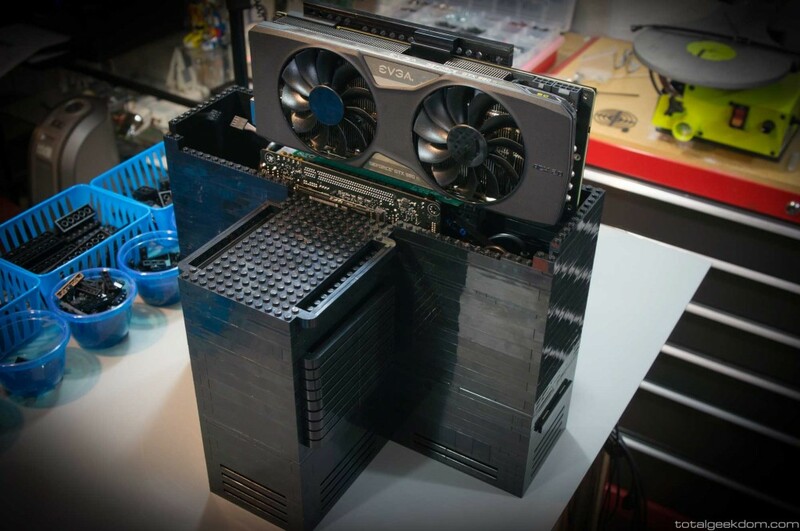 People have been building their own PCs for ages. 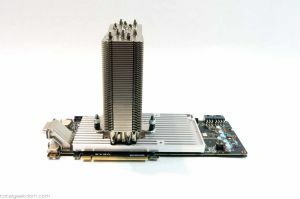 Some build them for work others build them as a hobby but most gamers build their own PCs because there is no PC in the market that could give them best power, resources and hi-res videos to accompany the resource hungry games. One such gamer is Mike Schropp. He has build a custom gaming rig which has top-specs available in the market. What’s more, he has themed his gaming rig on Lego. The end result is that Schropp’s Lego Gaming Computer is a top-spec, completely-built-from-scratch X-shaped gaming rig that’s made entirely out of Lego bricks. To make his custom PC, had to make some ingenious customisations like a custom-made GPU heatsink and a transverse-mounted motherboard that separated the GPU’s airflow path from the other components. Another gamepoint to Schropp is that he has made each and every component of Lego Gaming PC easily swappable. While it isn’t clear from the photos, the case consists of two parts: the main chassis, which houses all of the computery bits, and then a cover that slips over the top. There are no screws holding the outer cover on. Schropp has made many changes in the way his gaming PC looks or is designed. 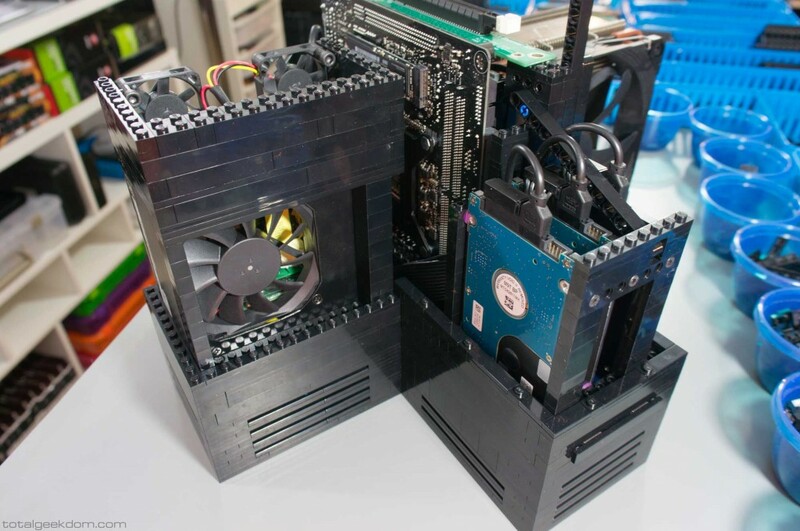 In a normal desktop PC case, the CPU heatsink hangs free; in the Lego gaming computer, the heatsink and fan are fully supported by Lego bricks. Similarly, the graphics card is fully supported by Lego so that it doesnt shake or wobble. Schropp has also made a separate inlet for the power supply which has a exhaust separate from the main airflow system. This could cool the PC quickly even while playing the most severest of resource hungry games. To aid with cooling, Schropp has included six main Noctua system fans: three at the bottom of the case that pull air in, and three at the top for exhaust. Schropp has also included cooling fans for GPU and the CPU. All in all, Schropp’s Lego Gaming Computer is one of the most awesome custom build gaming PCs seen in a long time. It didnt come cheap for Schropp and it would come cheap for you. The basic Lego Gaming PC can cost $1,600 for a Core i5/GTX 950 and touch the roof from there. If you are interested in building your own custom gaming rig, you can follow Schropp’s really long blogpost here. I just hope that the bricks wont deform overtime due to the heat coming out of those components. Lego is made of ABS plastic, which has a melting point of around 105C, and will start to deform around 85C. If you checkout the link back to my site you’ll see some thermal images showing temperature measurements of the case itself with the system running at full load. The Lego itself doesn’t get much warmer than 27-28C, which is very far away from the 85C deformation point. So there is really no chance that the Lego could ever get hot enough to deform, it’s barely warm to the touch in most cases. LOL you really like Lego stuff, a passionate Lego master… My neighbor has built a bridge with toothpicks (which is quite an endeavor), and you seem as passionate as he is… Have you done other things than PC casing with Lego? Wow! awesome rig! don’t you have a problem with heat on that computer? i mean every parts was tightly packed inside. But i like the way it looks and the hardware installed.